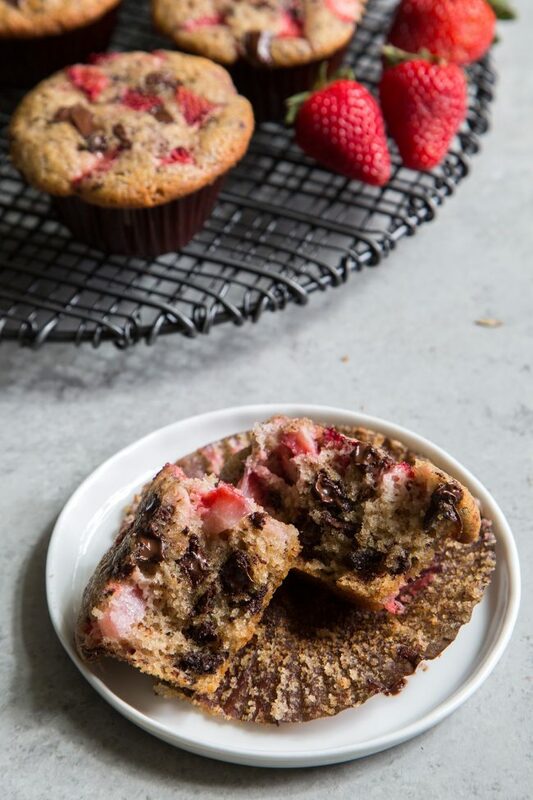 These dairy free chocolate strawberry muffins are made with coconut oil and almond milk. Strawberry season has arrived in Southern California. Each spring I look forward to driving up to Oxnard and loading up on fresh picked California grown strawberries. At the peak of strawberry season, you can smell the sweetness in the air on the drive up. It’s intoxicating. This marks the first in a dozen or so strawberry recipes I’ll be sharing this season. I’m super excited to share these muffins with you. 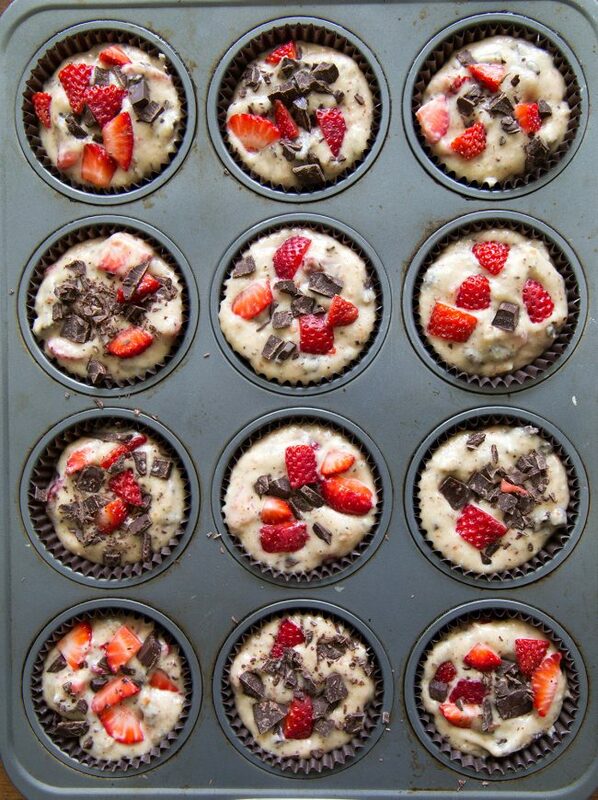 These breakfast muffins are bursting at the seams with dark chocolate chunks and fresh strawberries. I may have gone a little overboard with the amount of chocolate and strawberry in each serving. There’s nothing worse than getting a muffin with a measly amount of it mix-ins. I want it to be filled to the brim with the exciting stuff. When it comes to muffins, I say more is better. 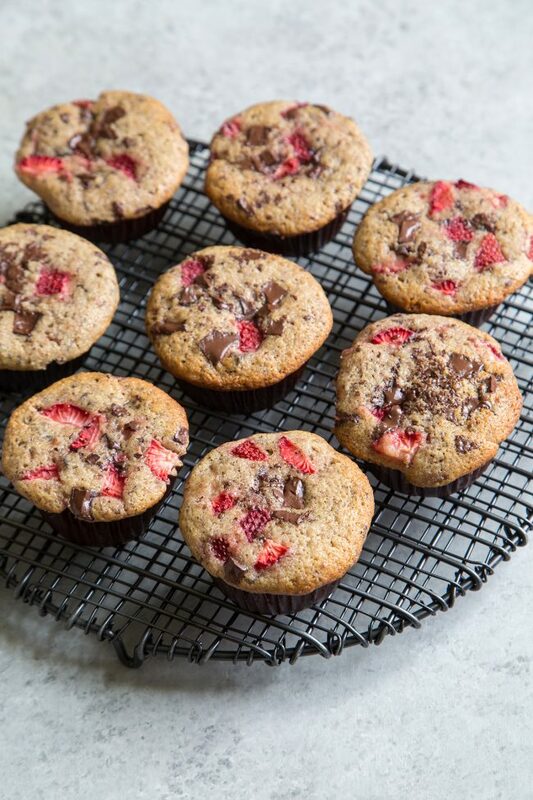 These chocolate strawberry muffins are dairy free! That’s a first for me. I’ve been experimenting with nut milks and I’ve fallen madly in love with homemade almond milk. I’ve been making my own almond milk weekly. As a result, I have a ton of almond meal (almond pulp) leftover. Rather than throw it out, it’s great for adding additional texture to baked goods. In place of almond pulp, you can substitute in almond flour, whole wheat flour, or additional all-purpose flour. Since this recipe uses coconut oil instead of butter, these muffins stay soft and moist. Coconut oil melts at a relatively low temperature (around 76 degrees F), whereas butter melts at a much higher temperature (around 90 degrees F). Immediately out of the oven, these muffins will be very delicate and crumbly. Allow the muffins to cool in the pan for about 10 minutes before transferring to a wire rack to cool to room temperature. The muffins will stiffen up and regain their structure as it cools. Preheat oven to 350 degrees F. Line muffin tin with paper liners or generously coat with nonstick spray. Set aside. In a large bowl, mix together melted coconut oil and sugar until smooth. Add eggs, vanilla, and almond milk. Stir until thoroughly combined. Fold in almond meal. In a separate bowl, whisk together all-purpose flour, baking powder, baking soda, and salt. Add to large mixing bowl and stir to combine. Before flour is completed mixed in, add chocolate chunks and strawberries. Fold until mix-ins are thoroughly distributed and there are no longer any dry streaks of flour in the batter. Divide batter among prepared 12-cavity muffin tin. Bake for 30 minutes, rotating muffin tin midway through baking. Allow muffins to cool in pan for 10-15 minutes before transferring to wire rack to cool completely. Hot muffins will be very delicate and crumbly. Muffins will regain strength and structure as it cools. Enjoy warm or at room temperature. Store muffins at room temperature for immediate consumption, or keep in the fridge for longer storage. I used homemade almond milk using this recipe. Store-bought almond milk, soy milk, or regular cow's milk also work. Almond pulp (almond meal) refers to the leftover ground almonds used in almond milk making. Substitute almond flour, whole wheat flour, or additional all-purpose flour. you can never go wrong with chocolate and strawberries! plus, i love the sound of coconut oil and almond meal in these; they sound so much more flavorful with those ingredients! Thanks! I agree- chocolate and strawberry is always a great pairing! Love that you used fresh strawberries! Love strawberries and chocolate together! These muffins are DREAMY! I’ve been obsessed with all things strawberry recently, so I cannot wait to bake these beauties. I’ve recently started adding almond pulp to pancake and muffin batters. I love it! Those almond maple syrup cookies sounds delicious! These look SO good! I’m always such a sucker for chocolate and strawberries together! So perfect for an easy breakfast! 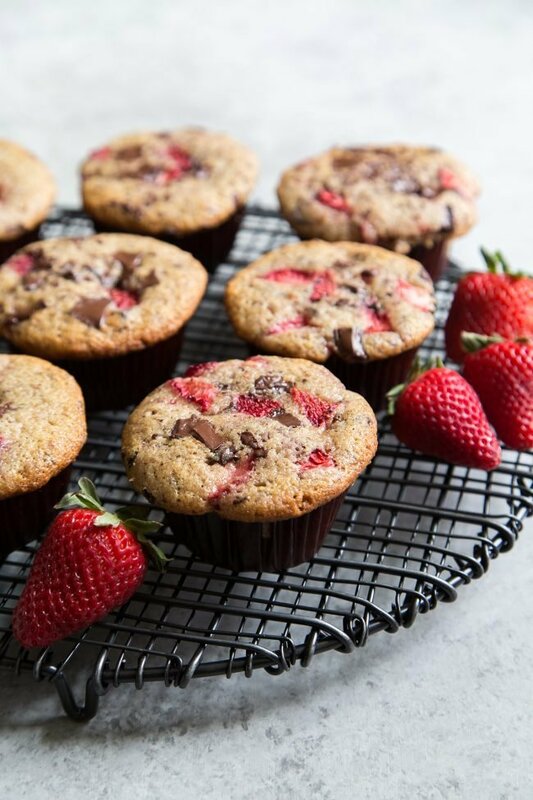 I love the generous amount of fresh strawberries and dark chocolate chunks in each muffin! Delicious! I can’t wait for strawberry season to start here so I can make these! I’m LOVING those chocolate chunks in there!! Thanks! The more chocolate, the better! I can’t wait till I retire then I can try your wonderful recipes! I’ll even try the cocktails! I need to make you a retirement cake! What can I use instead of melted coconut oil? You can sub in melted butter or vegetable oil.